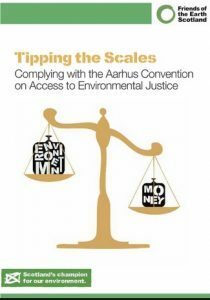 The Aarhus Convention Compliance Committee has held, in Findings and Recommendations, that the European Union is in violation of the access to justice provisions of the UN Aarhus Convention. Based on a complaint from ClientEarth, Friends of the Irish Environment and others, the Committee found that the EU has failed to comply with Article 9 of the Convention that provides protections for all citizens of the EU for access to justice to contest any act or omission that contravenes environmental laws. 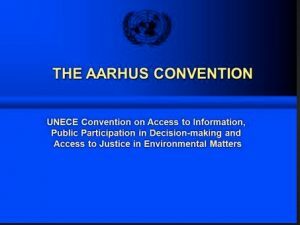 The Convention on Access to Information, Public Participation in Decision-Making and Access to Justice in Environmental Matters, known as the Aarhus Convention and adopted in Aarhus, Denmark, was a landmark agreement for public participation in environmental matters. Besides providing for the right of everyone to receive environmental information that is held by public authorities (“access to environmental information”) and the right to participate in environmental decision-making (“public participation in environmental decision-making”), it provided for the right to challenge public decisions that have been made in contravention of the two aforementioned rights or environmental law in general (“access to justice”). All members of the European Union, as well as the EU itself, are parties to the Convention. The Convention was intended to have a wide reach and key terms such as “public authority,” “public concerned,” and “environmental information” have been broadly construed to effectuate its purposes. To promote and improve compliance with the Convention, the Parties established the Aarhus Convention Compliance Committee. The Committee is fully independent of the Parties and holds hearings and takes submissions from interested entities and issues findings and recommendations. Actions by the EU, including decisions by the Court of Justice of the European Union (“CJEU”), are reviewable by the Committee to determine compliance with the Convention. The Committee is not a court and its findings are not enforceable against the Parties to the Convention. But the Committee reports its findings to the Meeting of the Parties (“MOP) for consideration, and so far the MOP has endorsed all Committee findings on non-compliance. Unfortunately the European Union (EU) has not been so generous in its interpretation of certain provisions, of the Convention including the access to justice protections. To the extent that the EU attempts to limit the scope of the Convention as applied to EU actions, those same restrictions are likely to be adopted by the Member States. In 2008 the environmental non-governmental organization (eNGO) ClientEarth, and several entities, including eNGO Friends of the Irish Environment, and a private individual, Ludwig Kramer, submitted a claim to the Committee that the EU was failing to comply with its obligations under article 3, paragraph 1, and article 9, paragraphs 2, 3, 4 and 5 of the Convention. In the key provision, in Article 9(3), the Convention provides that the EU must ensure that members of the public have access to administrative and judicial procedures “to challenge acts and omissions by private persons and public authorities” that contravene laws related to the environment. The language is fairly broad in its reach. ClinetEarth and the other complainants argued that the EU has limited legal challenges to EU laws or actions to only those that impact an individual concern, like a denial of a permit or license, and not for impacts of a general scope for many citizens, like a policy to adversely affect natural resources. The claim also alleged that the EU Aarhus Regulation, in Paragraph 10, limited access to internal review of acts or omissions to only NGOs and excluded such protection to individuals or entities other than NGOs, such as regional and municipal authorities. In 2011, the Committee found that there were several cases before the European Courts that related to the very questions raised by the complainants, and that it would await the outcome of those cases before ruling on the submissions. However, the Committee did recommend that in the meantime the EU take steps to further clarify the protections afforded by the Convention for access to justice in environmental cases. In 2014 the claimants submitted that it was time for the Committee to rule on its claims as the cases before the European courts had not and would not resolve its claims. The Committee agreed and issued its determinations in March 2017, after further briefings by the parties. The Committee found that a recent decision by the EU General Court, formerly the Court of first Instance, in a case called Stichting Milieu, had broadly and correctly construed Article 9 of the Convention to provide protection for more than acts of an “individual scope,” as argued by the complainants. That decision might have satisfied the Committee that the EU was on its way to overcoming the shortcomings alluded to in the Committee’s 2011 decision. However, the General Court’s judgment was overturned by the Court of Justice of the European Union (CJEU), the highest EU court. Therefore the Committee held that it was appropriate, and timely, to determine the scope of the protection of Article 9 under the Convention and the implications of Article 10 of the Aarhus Regulation. The Committee found that Article 9 of the Convention expressly provided access to courts for appeal of “any acts and omissions.” It further found that Article 10 of the Aarhus Regulation limited access only to measures of “individual scope” and that limitation was incompatible with the broad protections set forth in Article 9. It also found that the provision in the Regulation limiting access only to NGOs, and excluding individuals and entites other than NGOs was also a clear violation of Article 9 and unfairly limited access to justice for members of the public. In addition, the Committee found that the Aarhus Regulation limited access to a review of acts “adopted” under environmental laws whereas the Convention clearly also reached any “acts and omissions,” which would include any measure that contravened a law relating to the environment, even after that law had been adopted. While the Committee does not engage in a detailed explication of what distinguishes matters of an ‘individual scope” and more general matters, we can glean some sense of the distinction from several cases before the EU courts. Acts affecting a specific permit or license would constitute acts of an “individual scope.” Acts of general application would include the European Commission granting an extension for compliance with an air quality Directive, as happened in cases involving the Netherlands and United Kingdom, or the Commission setting maximum residue levels of pesticides in products, food and feed. These latter two cases would arguably be excluded from the protections of Article 9 under the EU rationale behind the Aarhus Regulation. The Committee recommended that the EU Aarhus Regulation be amended to come into full compliance with the Convention, as set forth in the Committee’s Findings and Recommendations. The EU failure to abide by Article 9 of the Convention carries consequences beyond the field of environmental law. Recent events, including Brexit, the immigration crisis, and rise of populism and nationalism have raised questions about the EU’s lack of transparency and lack of accessibility for ordinary citizens to the distant structures of power. Certainly access to justice within the EU is a core element of its democratic mandate. The Aarhus Compliance Committee needs to be listened to and its recommendations need to be acted on. David Hart, “Aarhus Convention trumps EU Regulation, says EU Luxembourg Court,” UK Human Rights Blog (18 June 2016). Previous articleThe Space We Have: Planning for Ireland in 2040 Next articleIIEA on Brexit and the Climate: The harder the Brexit, the hotter it gets?